Join Us for Our First Anniversary Celebration! It’s our anniversary and time to celebrate! 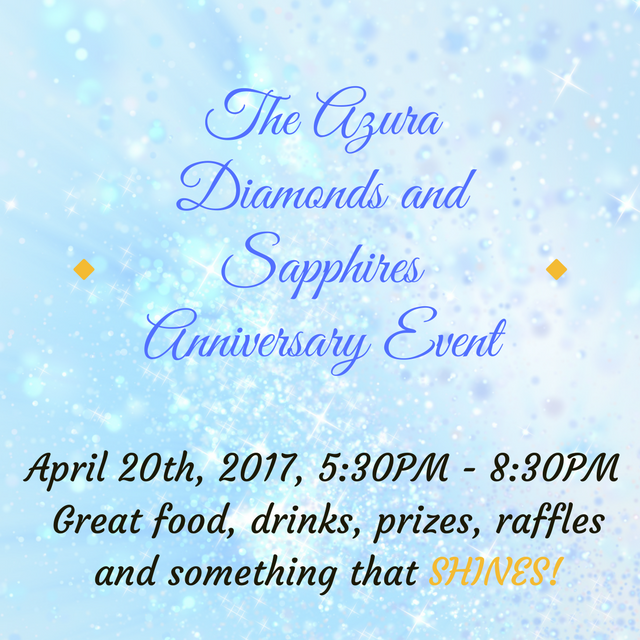 Join us for Azura’s Diamonds & Sapphires Party on Thursday, April 20, 2017, from 5:30 p.m. until 8:30 p.m.
You’ll definitely want to be here for our top raffle prize of the evening – a custom-designed piece of jewelry worth $2500 from our neighbors at JM Edwards Jewelry in Cary! You must be present at 8 p.m. for your chance to win this top prize. Read all about the special offers we’ll have at the party here! Buy one package of laser hair removal this month and get one area free of equal or lesser value! Read Jennie’s seven reasons to get laser hair removal. During April, enjoy 10% off all fillers! When you call or email to book your appointment, add a microdermabrasion treatment prior to your filler appointment for only $59. Save Even More: Enjoy half off brow waxing prior to any filler treatment! Read about fillers at Azura. With prom, spring formals, and graduation on the horizon, now is a great time to tackle acne before the cameras start flashing. This month, acne facials which are regularly $95 are only $80, or purchase a package of three treatments for just $225! Learn more about our facials. Tune in for our next Facebook Live with Azura client Miss North Carolina USA Katie Coble as she talks about getting pageant ready and her skin care routine. Save the date for April 20, 2017, at 11:00 a.m. — that’s the morning of our anniversary party! Are you getting married this year or know someone who is? Contact us at 919-307-8033 or email Hello@AzuraSkin.com about our Bridal Boot Camp Program. We’ll have you looking gorgeous for your big day and beyond. Read about our skin care packages for brides and grooms!